For more than 30 years, Humberto Reyna and Verni Moore have been the design team behind some of the most prominent and easily recognizable brands in the region. Sharing the responsibility of being creative directors for the full-service design firm Reyna-Moore Advertising, the team designed brand marks for the Oregon Association of Minority Entrepreneurs, the Hispanic Metropolitan Chamber of Commerce, the U.S. Fish and Wildlife Service, just to name a few. The two have designed wine labels for wineries across the continent. 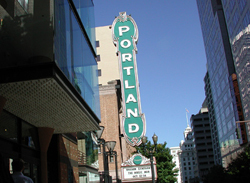 The Reyna-Moore team also designed one of the most enduring and recognizable landmarks in Portland: the Portland sign and marquee that adorn The Arlene Schnitzer Concert Hall. With more than 30 years’ experience in the graphic arts industry, the Reyna-Moore team is considered the experts in the field. Their working relationship started at Portland State University. 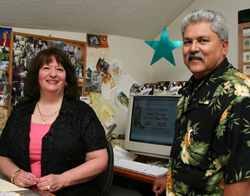 Humberto Reyna was working as a faculty member and admissions counselor, when he met Verni Moore, a senior graphic design student who was working on design projects for various departments at PSU. “I was part of a work-study program, where I produced marketing and publicity materials for the university,” said Verni, who also worked for “The Daily Vanguard” PSU’s student newspaper. When she graduated with her graphic design degree in 1976, Verni decided to rent a studio in downtown Portland. “I couldn’t resist the opportunity: my overhead was only $100 a month,” she said. She started working on developing logos for local businesses, and soon began drawing more and more clients. “We’d meet for lunch almost everyday. We’d talk about work, projects, and share ideas,” said Humberto. He worked at PSU for two more years before deciding to quit his full-time job and join forces with Verni to expand her growing list of clients. “The decision wasn’t easy. It was hard to give up a salary,” said Humberto. He jokes that at first, taking the plunge into entrepreneurship felt more like jumping “into-manure”-ship. The two started out in the business doing hand paste-ups, working on light tables to align type. To enhance services offered to its growing clientele, the Reyna-Moore team acquired Qualitype, a typography business. The two admits that they had to transcend a steep learning curve in managing Qualitype, because the two were both brand new to the typography business. When digital typesetting became more widely used, Reyna-Moore Advertising seamlessly made the transition from hand paste-ups to digital. According to Verni, the strength of the Reyna-Moore team is not just innovation and creativity, but also solving problems and coming up with the appropriate solutions required to meet clients’ needs on time and within budget. “Many people call on us to help them solve their problems on projects dealing with design, printing, software and computer questions,” said Humberto. The process of working with clients often requires a great deal of exploration and research. “We find that when you ask the client the right questions about their preferences regarding color, style, imagery or fonts, the piece automatically designs itself,” Verni said. Two heads are better than one, and that’s how Verni and Humberto approach projects they take on. “We value each other’s opinions. We often pass ideas back and forth until we come up with designs that truly reflect the clients’ particular identity and personality,” she said. If you own or are part of a family business that you'd like to see profiled in Oregon Minority Business, write to us.